So you’ve done the research. You know who your target consumer is. But how do you make sure everyone else understands who they are, just as well as you do? Or how do you enrich the existing learning and bring it all to life? Film offers the opportunity to embed your target consumer, segments, or ‘personas’, within your organisation, like no PowerPoint presentation could ever do. By transporting viewers into your customers’ worlds, you challenge misconceptions, build empathy, and make these customers more than just a statistic! For this type of film, storytelling is key. You’ll likely have a good idea about your overarching messages, so it’s important that you relay this to whoever is producing your film – after all, it needs to support and enrich your existing research, not go against it! The trick is to think of the end at the beginning. In other words, what do you want the viewer to take away from the film and what will success look like? A lot of this will come down the recruitment – ensuring your video features people who completely embody your target consumer or segments, be it the demographics, attitudes or behaviours that define them. Using a well-executed screener is just as important for a target consumer film as it is for a traditional qual research project. So how many people do we need to have in this film? 1? 5? 50? Well, I’m afraid there’s no perfect answer, but keep in mind that this is a qualitative tool. You’ll never be able to 100% accurately represent your entire customer base, but that’s not necessarily what these films are about. They are about building a connection to your target audience and often the less people you have, the more powerful that connection can be. Furthermore, such films work best when they are enhancing and adding colour to a much wider communication strategy, which could include other data sources, photos and videos. Think about this: How many people can your audience realistically remember and keep in their mind after watching your film? And if we have too many people within it, will the audience really have the time to truly get beneath the customers’ skin and connect with them? 3. Keep it real, man! Surprisingly often we hear the horror stories of clients who’ve tried (and failed) to use actors to represent their customers. Don’t insult your audience’s intelligence by thinking that they will believe and, more importantly, engage with ‘perfect caricatures’ of your customer base. Imperfection = authenticity. Whilst it’s important to feature articulate and charismatic respondents, airbrushed visuals and oh-so-perfect soundbites will not be taken seriously and won’t get the cut through you need. By interviewing real consumers we enrich our learning, as well as attaining the unexpected, anecdotal comments that add personality, build connection, and demonstrate that these are actual, real-life human beings! But do not fear… just because you’re using real people, it doesn’t mean you can’t control the content. A carefully crafted discussion guide with the right respondents can successfully elicit the golden quotes you’re looking for, without putting words into their mouths. And a lot of the art comes in the editing stage too – formulating the story you need to tell. After all, the only thing worse than using actors to read a script is trying to get your consumers to read one instead! Bonus points here for getting your audience to react to your film with a LOL or maybe even a tear! Don’t make the mistake of overlooking a humorous anecdote or sensitive moment just because it isn’t deemed ‘insightful’. These are the nuggets that can make your film remembered beyond the presentation… beyond the conference… beyond the induction workshop. Several years ago we produced a series of mobile ethnography films to bring to life Barclays’ key customer segments. 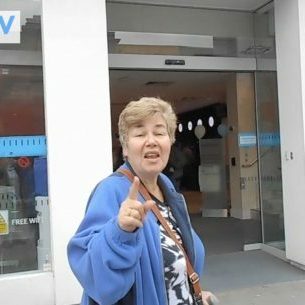 A retired couple, Jacqui and Howard, filmed a hilarious moment of themselves bickering outside of a Barclays branch in Edgware, which we featured in one of the films. Even now, this moment is remembered fondly by our clients at Barclays and, testament to the power of film, they loved the couple so much that some colleagues even started referring to the segment as ‘Jacqui and Howard’! “It was completely engaging content and more ‘up-close and personal’ than we had expected. Subjects gave us much more detail about their lives than we could have possibly got by traditional methods of research” Roy Hammond, Vice President, Group Senior Insight Manager at Barclays. As video becomes ever more omnipresent, so the likelihood to switch off from it increases. Video is no longer a welcome change – it’s become an expectation – and we’re consuming more of it each day that we care to realise. We’re also becoming more and more time-pressured too. For these reasons, your audience (even if you consider them to be a captive one) expect their time to be valued with highly succinct and engaging content. As any researchers who’ve used video will likely know, it can be a huge challenge to be ruthless with content when you’re faced with lots of great quotes. But the more cutthroat you can be, the more impact your deliverables will have in the long run… trust me! OK, so your budget (or your client’s budget) probably won’t stretch to Hollywood blockbuster standards, but there are relatively simple ways to boost the creativity of your film without breaking the bank, to keep your audience engaged. Perhaps it’s a case of filming some ‘b roll’, or in other words all those lovely contextualising shots that show your customers watching that TV programme, using that fabric softener, or illustrating that they are your active, health-conscious segment! Or perhaps you can add some fancy on-brand graphics to highlight some buzz words or add in some stats from your quant research? Not only will these additional ‘layers’ make your video content more exciting, they will also make it more insightful. Win, win! Adding a bit of carefully selected music can also help enhance the film and set the mood – be it inspirational, emotional, or representative of the specific persona you are looking to illustrate. Royalty-free music has come a long way since the ‘lift music’ it once was! Your audience can be a fickle bunch. Grab them within the first 10 seconds, or risk losing them altogether! When it comes to video content we’re all guilty of checking the progress bar at the bottom to see how long it’s going to be and, perhaps even unconsciously, we’ll make a decision as to whether we’re going to continue investing our time in it. It’s therefore crucial to get into the good stuff very quickly and start with some really captivating content. Don’t waste time introducing the film with lengthy background information – leave that for the PowerPoint deck! Now, without insulting your audience’s intelligence, don’t assume that they’ll automatically know what you want them to ‘do’ or ‘think’ as a result of watching your film. A clear call to action within the content will reiterate what you want your viewers to do next. Perhaps it’s about asking them to think about the impact they can have on these customers personally, directing them to the wider research materials, or inviting them to contact the insight team for more details. Whatever it is, make it crystal clear! So you’ve created the film – job done, right? …Far from it! Getting your film seen by everyone you want to see it is in some ways even more challenging than creating it in the first place. How you roll your film out is somewhat dependent on your audience, but the first barrier to cross is likely to be the technical one. Will your audience actually be able to access your film? How will you send it to them without IT getting their knickers in a twist? Can they play video on their devices at work? Will they be able to hear it? And how can you ensure the content doesn’t get lost or deleted? Unilever tackled these challenges by creating an interactive portal called PeopleView to make their global consumer films as accessible as possible for everyone around the business. Watch an explainer video below, read the full case study, or watch the video testimonial. Once you’ve worked out how to get your video seen by your target audience, consider how you’re going to get them to continue to engage with the content and apply the learning within their roles. Can you utilise your internal social media platform? Can you create a teaser trailer or further ‘topic’ videos to release at a later stage? Can you use photographs or an infographic to accompany the video? Or can you plan some sort of required interaction with the content? Innocent’s insight team created a game of ‘Consumer Guess Who’, as well as a printed infographic, to promote continuing engagement with their multi-market target consumer film. Watch the short video below to hear more about their approach. This entry was posted in and tagged Consumer, Film, Video. Bookmark the permalink.